> The Hive Honey Shop Win 2011 Best Regional Honey Award! Last night The Hive Honey Shop were awarded one of the top honey awards, the Regional Honey Award at the London Honey Show. 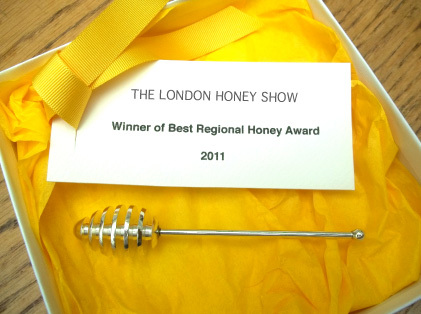 Entries from all the London regions were entered and The Hive scooped the top prize. James, our veteran bee expert, was there to accept the award, a beautiful silver plated honey dipper. The event has hosted at the prestigious Lancaster London Hotel W2, organised by Jo Hemesley, corporate Senior Sales Manager for the Lancaster London.